It is a fun-filled activity for kids and hobbyists alike. 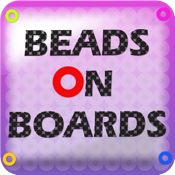 If you like to make bead patterns, Beads on Boards is the App that you must have in your App repo!! - Seasonal patterns are added regularly. - A special feature allows you to change colors combinations of the pattern. So keep shuffling till you get the look that you like. - Convenient listing of all colors used in the pattern. Even lets you select a color and view only the beads of selected colors in the design. - Use an image from your photo album or one downloaded from internet. Any image can be converted. - You can even further edit the pattern..change colors or save or make a copy..Isn't that cool ? - More so, a quick import of patterns shared by your family and friends in your App. - A genius tool that lets you canvas your own design. - Tool is very easy to master. - Comprehensive tutorial videos in the app to learn about each and every feature..
- Shop for pearler beads activity kit with in the app.